RallyCross is a timed competition pitting a driver and his/her vehicle against a defined course. The course is delineated by cones on a non-paved surface such as dirt, gravel, or snow. Participants attempt to traverse the course as fast as possible. The entry fee and equipment requirements are considerably less than most other forms of rally motorsports. 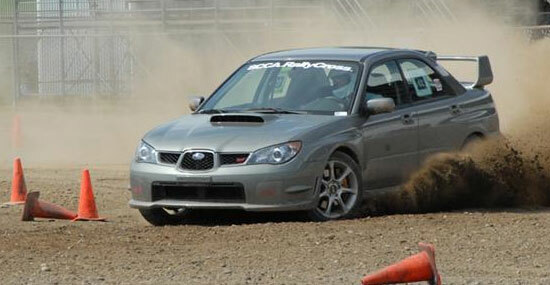 For some, RallyCross is a fun way to practice low traction driving skills. Others just enjoy the fun and camaraderie of the day with other auto enthusiasts. And to others, it's their first step towards performance rallying. RallyCross is a cost effective way to measure interest and skill at "doing it in the dirt" as well as a great way to practice your car control skills. Because the course is laid out with cones, a driver can make a mistake and not suffer damage to their vehicle that they would if they hit a rock or tree practicing on back roads. You can drive your own car! Many contestants race the same vehicle they drive to work each day. The car must be mechanically sound and have working seat belts and a hard top. All loose items from the interior and trunk need to be removed for safety reasons. Entrants must have a Snell 95 or newer helmet. There are different classes of vehicles, based on the vehicle and improvements, if any. The classes are Stock, Prepared and Modified, in both 2 wheel drive and 4 wheel drive groups. Each run around the course is timed and recorded. At the end of the event, all of a driver's times are added together. The total times of each driver within the class are compared. The driver in each class with the lowest cumulative time wins. Check the calendar for upcoming events and come on out. If you're unsure if you want to actually race, there are opportunities to become involved by working corners, flagging, or doing timing and scoring. There are plenty of regular rallycrossers at each event that will talk with you about how the events are run, how to prepare a car, how to drive fast through a corner, and more. Come to an event and find out what sweeper, slalom, e-brake turn and left foot braking are all about.